SoapBoxLA: Good For Bikes! Good For Business! Good For Bikes! Good For Business! Several years ago, the City of Los Angeles embarked on an ambitious campaign to provide bicycle parking throughout the city in order to encourage cycling as a form of transportation. Cyclists were grateful! In 2004, the LADOT installed over 800 Inverted U Bike Racks bringing the Citywide total to 2500 bike racks in the City of Los Angeles. 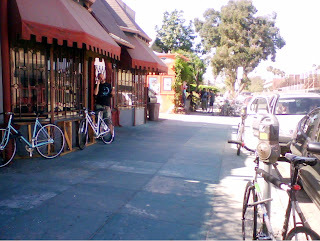 In 2005, the LADOT promised to install another 600 Inverted U Bike Racks, all on city-owned property, usually sidewalks of adequate width. Cyclists were pleased! Somewhere along the way the Bicycle Parking Program became low priority for the Bikeways Department of the LADOT and the bike racks began collecting dust in a warehouse in Van Nuys. Cyclists didn’t say anything. 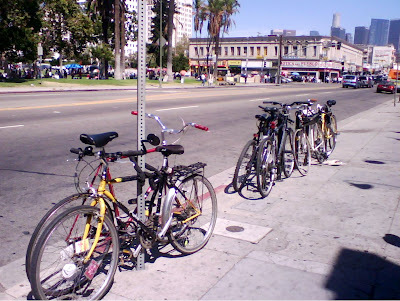 In 2006, the Bikeways Coordinator for the LADOT Bikeways Department explained that the Bike Parking Program was on hold because of staffing issues. (The Department consists of a Coordinator, a Lead Engineer and 9 other Engineers!) Cyclists still didn’t say anything. In 2007, the Bicycle Advisory Committee for the City of Los Angeles met for its regular bimonthly meeting in the Board Room of the DWP Building. Cyclists spoke up! 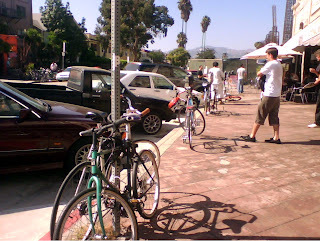 As part of a ride called “Storm the Bastille” the cyclists gathered at the Santa Monica/Vermont Red Line Station and rode to the BAC meeting, this time prepared to focus their Public Comment energy on the subject of Bike Parking in LA. Representing communities from San Pedro to Highland Park to Hollywood to the San Fernando Valley, the cyclists asked the LADOT to revive the dormant Bike Parking Program. 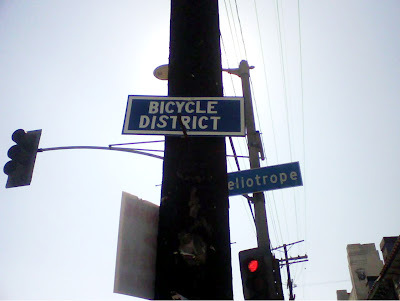 Cyclists called on the LADOT to act! The City of Los Angeles currently has an average of 6 bike racks per square mile. Cyclists complain that in spite off all the talk, the City has failed to offer the most basic support for the cycling community; safe and secure parking facilities. 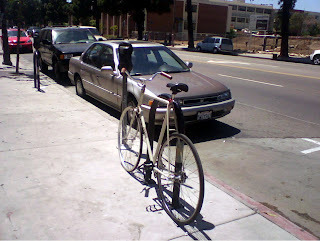 To make it worse, it’s still illegal to lock your bike to a parking meter in the City of LA. The Inverted U Rack is simple, it doesn’t take up much room, it’s cheap, it’s effective and it works. If you’d like to know more about Bicycle Parking take a look at the recommendations from the Association of Pedestrian and Bicycle Professionals.